Musicfest; the product of three weeks of practices late into the night and unyielding perseverance by the skilled musicians of every house. This year’s Musicfest had unprecedented popularity amongst the students, which saw the LT packed to the brim by eager students, and latecomers settling for standing at the entrance; it was quite a contrast to last year’s, during which there were enough unfilled seats to have the performers be able to sit down. It was indeed quite the crowd, as our bubbly emcees Lin Sheng Jun (15S05A) and Ryan Chan (15S03I) pointed out. 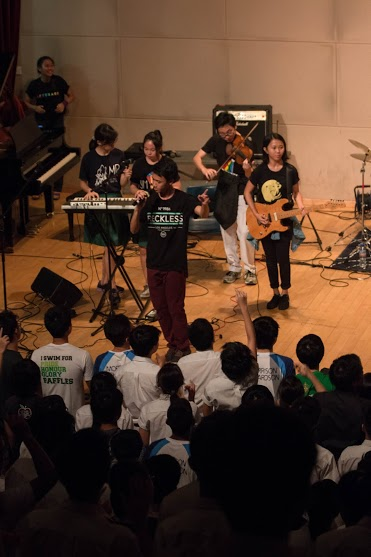 With songs from worldwide stars and bands being featured, all of Raffles was pumped up for this much desired break from the stress of school life, where they could just let their hair down, show their house spirit and rave to the brilliant performances put up. Emcees Ryan Chan and Lin Shengjun hyping the crowd up before BB took the stage. 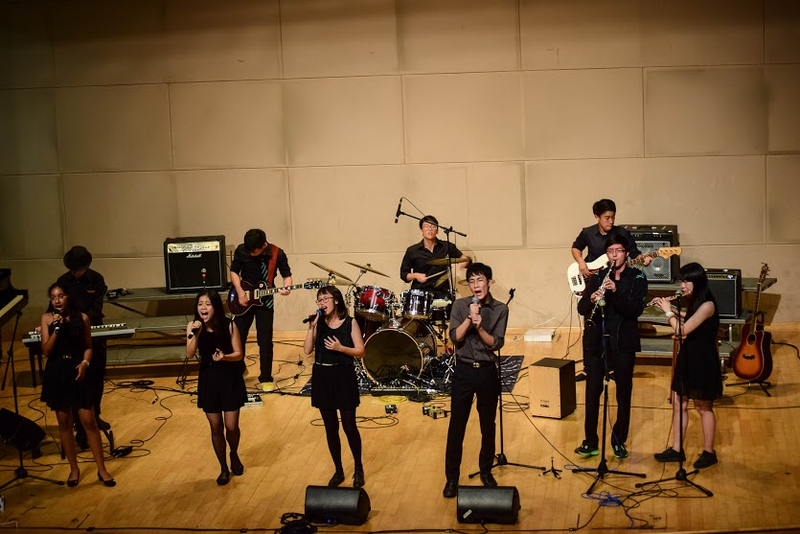 Whereas Chamber Ensemble was responsible for last year’s Musicfest, this year’s competition was organised by Raffles Rock, and the bar was also raised. Teams had to perform songs from a given artist, a part of which had to be in a given style, with a special requirement, all chosen at random. According to a member of the organising committee, it was initially thought of as a way to generate interest in Musicfest amongst the students, but it also lent a very interesting dynamic to the performance, which truly allowed each house to showcase their creativity and finesse. Restrictions were deliberately flexible to allow teams freedom of interpretation, and to have fun performing on stage. In addition, there was a set minimum of three songs to perform, with an optional fourth song that could be included. While the technical and musical skills of each house were praiseworthy, those alone were not enough to triumph the competition; audience appeal and popularity were also significant deciding factors. Win over the audience with popular, engaging songs, and you win over audience votes (hopefully enough) to vie for the first place. 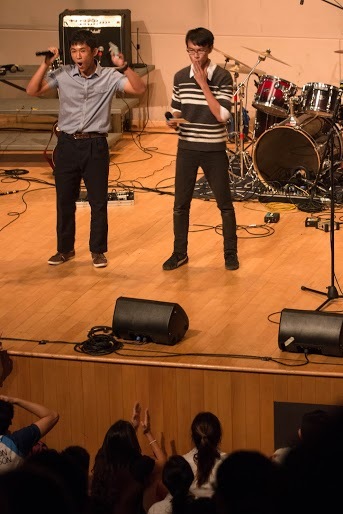 Judged by our own sound technician Mr. Hazli, Raffles Rock Teacher IC Dr. Lena Liu, and local pop artist turned entrepreneurs duo Jack and Rai, who often performs at various venues and are involved in several music festivals, the event started off on a high note. BB’s extensive variety of highly skilled musicians gave them an edge over many other houses that night. Up first was Buckle-Buckley, and their solid arrangement was performed impeccably with a unique addition of beatboxing vocals in the middle of “Bang Bang” by Jessie J, Ariana Grande and Nicki Minaj. They finished off with their challenge song, a jazz remix of “Thinking Out Loud” by Ed Sheeran, which played out smoothly down to the last note. Near the end, guitarist Alexander Leung (16A01A) successfully rallied the crowd to sing the last few verses with them; and as for the last line, house members sitting on the stage held up placards with lyrics on them for a stylish finish, earning the favour of the enthusiastic audience. The passionate House Comm of BB also showed their unending support for their house as they occupied a whole row of seats and gave standing ovations to their house members. BW’s performers rose to their country-acapella challenge with gusto. Bayley-Waddle took the stage next. Wowing the audience with their rendition of “Uptown Funk” by Mark Ronson ft. Bruno Mars in particular, the performers were suitably decked out, with the vocal leads dancing along to the song in sunglasses and leis. The passion exuded certainly moved the audience, bringing the excitement to a new level. 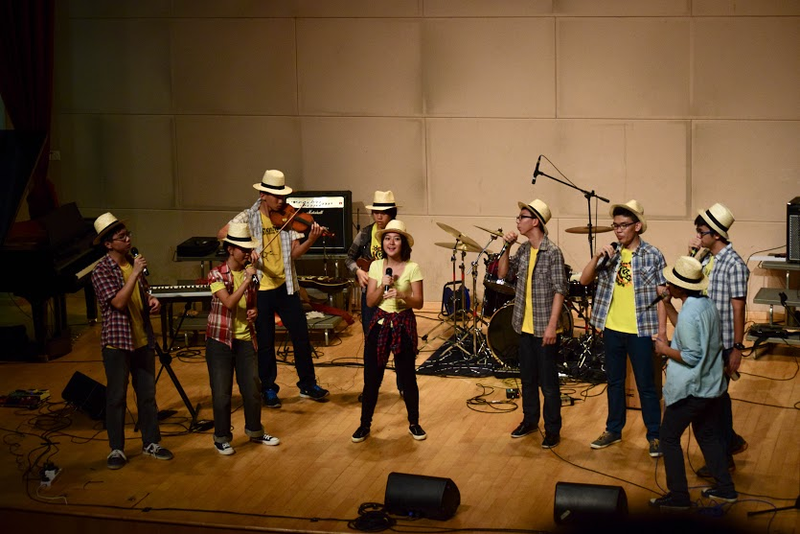 Their challenge song, “Ain’t It Fun” by Paramore was performed in a capella with some beatboxing thrown in, as well as with a violin and a ukulele. Although they missed out the ‘country’ aspect of the song, it was still clear that they had excellent vocals all around. Powerhouse vocalist Esther Chan hit all the right notes. Following after was Morrison-Richardson, performing a variety of songs. Their challenge song, which was introduced by guitarist Sun Yi (15S06G) parodying the character Lulu from popular local comedy show “The Noose” with a pink wig to boot, was a mash-up of “Thanks for the Memories” and “Light Em Up” by Fall Out Boy done in a charming oriental style with a rap battle. The musical prowess of the house was demonstrated further in their other songs; “Can’t Hold Us” had original lyrics written to suit MR, and with “Remember the Name” by Fort Minor showed off their rapping skills. 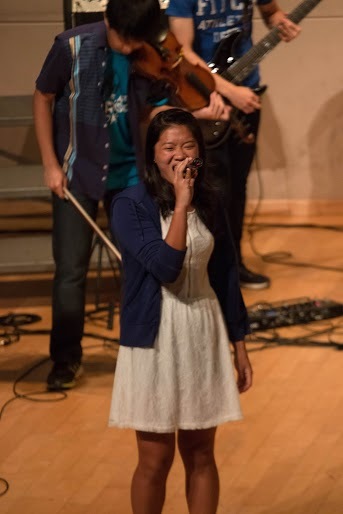 The vocals for “Runaway Baby” by Bruno Mars in addition to their challenge song were provided by their talented Esther Chan (15A01D). 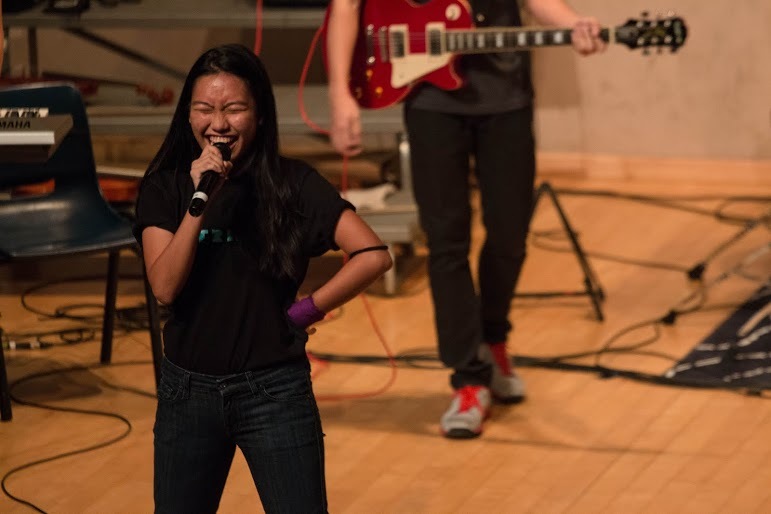 House captain Melissa Tang charmed the audience with her brilliant singing and sparkling personality. Hadley-Hullet charmed the audience easily with their charisma and confidence. Their challenge song, “Safe and Sound” by Taylor Swift, was played in the original key in the first part, before switching to a minor key and going Reggae style. 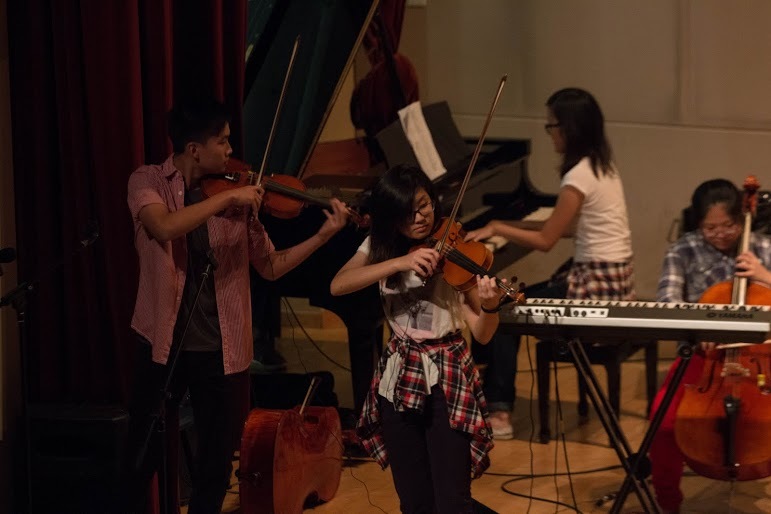 For the difficult and odd combination of Taylor Swift and Reggae, vocalist Edward Yao (16A13A) put in a remarkable effort, sending the crowd roaring when he and his duet partner held each others hands and looked into each others eyes as they sang their hearts out. My Chemical Romance’s “Welcome to the Black Parade”, their last song, was marked by house members doing their signature cheer as the performance went on, in an amazing combination and display of house spirit and affinity coordinated by their House Captain/vocalist, Melissa Tang (15S03Q). MT put up a commendable, technically skilled performance despite lacking instruments more commonly seen at Musicfest. Raffles Rock entertained the crowd while the judges deliberated. Reflecting on the organisation of Musicfest this year, Mark expressed that “Musicfeste was an event that took weeks of planning to pull off. It wasn’t easy, but it was worth it. There were problems with venues and such, of course, and I admit we weren’t able to pull it off as spectacularly as we’d hope to. But we’ll take it in our stride, to learn from this experience and do a better job next year if Rock organises it again.” Ultimately, the standings didn’t seem to matter as much as the whole school (or at least those that could squeeze into LT2) coming together and having a blast, regardless of being an onlooker, performer, or audience.